Growing up in Joplin, Steve Spracklen thought he’d like to be a musician. He also was a great fan of a fellow Missourian named Samuel Langhorne Clemens, better known as legendary writer Mark Twain. Not surprisingly, Steve grew up to fulfill both of those ambitions. He became a riverboat musician. “In 1979, I started playing music on the Mississippi Queen, then on the Delta Queen,” he says. From Dixieland to ragtime to barrelhouse blues, Steve played it all. He also pumped out plumes of steam and raucous music on the Mississippi Queen’s 44-whistle steam calliope, the largest on the Mississippi River system. If the wind was right, the melodious calliope could be heard for five miles. Over the years, Steve has also served as cruise director for the steamboat company and is now Riverlorian on my cruise aboard the American Duchess. 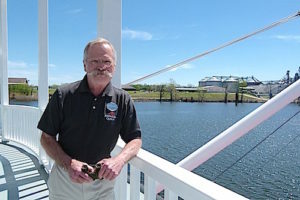 As Riverlorian – a historian specializing in the nation’s rivers and riverboats – Steve gives informal question-and-answer sessions and afternoon River Chats in the boat’s Show Lounge theater. The Chats are well attended and informative. He talks about the music of the rivers, the history, the people and the boats who have traveled America’s river roads. He also shares photos on a large screen in the theater. One of the true stories concerns the famous sternwheeler Virginia, built in 1895 by Capt. J. Frank Ellison for the upper Ohio River. Although her beauty was outstanding, the Virginia is most known for running aground when the depth of the Ohio River fell too quickly in 1910. The steamboat wound up in a West Virginia cornfield about a half mile from the river. “It became a big tourist attraction,” Steve says, showing an image of the steamboat sitting high and dry in the cornfield while tourists gather around. Eventually as summer went on, the farmer decided to charge rent to the Virginia’s owner. Instead, Capt. Frank hired a house-moving company to get the Virginia back in the river. After much maneuvering, the boat was hauled to the river bank where it got mired in the sandy edge. There the Virginia sat. Then the rains came. The river rose. And the boat refloated itself. In another frightening tale, Steve showed a series of graphic photos taken on April 19, 1979, when the towboat Cahaba came down the flooded Tombigbee River in western Alabama and encountered Rooster Bridge. With the river so high, the Cahaba was much too big to go under the bridge. And the flood waters were moving too rapidly for the towboat to stop. Amazing photos show the Cahaba being dragged underwater under the bridge by the fast-moving current. An amateur photographer caught the action as the Cahaba went under – only to pop up on the other side of the bridge, right itself, its engine still running and limp on. To hear even more fascinating river lore and legends, book a cruise on the American Duchess and make sure you’re in the audience for a presentation by Riverlorian Steve Spracklen. He never fails to enlighten and entertain – whether it is at a speaker’s podium or at a keyboard.